What do you think Herbert will do to "scratch" the EPF? He took a giant claw and scratched the Everyday Phoning Facilicty. I think with the box hes gonna put the EPF inside it and then melt the island! I think that there are new servers for the puffle party. Are there? I think the director is Herbet..
Just like when we first spotted the orange puffle, it still appears in flying in a box every 15 minutes at the box dimension! Good thinking. But as far as I know there isn't. But who knows? I'll keep an eye out. Good thinking. You never know, though! Hm, I think Hebert will steal one of the famous penguins. Perhaps Cadence, Rockhopper on G? I'd love to complete that mission Mimo! harder if you want to scratch the EPF. Our agents are incredibly skilled, and prepared for anything. Not noticed them, and I don't think there are. I'm sure Mimo would've informed us about this. If you mess with the EPF,you mess with the whole island.There are still many skilled penguin on the island that you don't even know about.If I have to,I will risk my LIFE TO PROTECT THE EPF AND I WON'T GIVE UP NO MATTER WHAT.BELIEVE IT!!! YOU WILL PAY FOR THE TROUBLE YOU CAUSED AND IF I HAVE TO DIE I WILL BE HONORED AS A HERO WHO SAVED THE ISLAND FROM HERBERT P. BEAR(and Klutzy)BELIEVE IT!!!!! 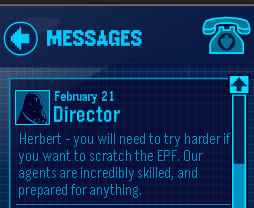 With the EPF agents, I wouldn't count on that Herbet. Diego 2310, said... If you mess with the EPF,you mess with the whole island.There are still many skilled penguin on the island that you don't even know about.If I have to,I will risk my LIFE TO PROTECT THE EPF AND I WON'T GIVE UP NO MATTER WHAT.BELIEVE IT!!! YOU WILL PAY FOR THE TROUBLE YOU CAUSED AND IF I HAVE TO DIE I WILL BE HONORED AS A HERO WHO SAVED THE ISLAND FROM HERBERT P. BEAR(and Klutzy)BELIEVE IT!!!!! Wow, you are realy BRAVE! Well, I hope everbody thats in the EPF works hard to overcome every Herberts chalgense! WHAT?!?!?!?! (sorry for the caps) How can that be??? P.S. I'm outraged by your idea, but it might be true. I'm glad your so brave! Keep it up! I would love to do that too! Who knows what Herbert will do though? I think you have a really good/awesome idea. We will complete the master plan watch your system EPF.